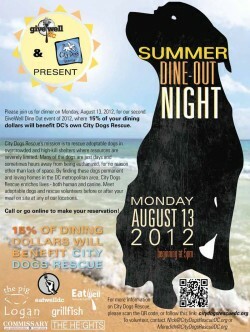 On Monday August 13th, 2012 for a single night, GiveWell DC will generously donate 15% of the total dining dollars from 5:30pm to 10:00pm collected at the five restaurants owned and operated by its parent company, EatWell DC (http://www.eatwelldc.com/) to City Dogs Rescue. The five restaurants are Logan Tavern, Commissary, Grillfish, The Heights, and The Pig and they are located in the Dupont Circle and Columbia Heights neighborhoods. To make the night even more fun, City Dogs Rescue will be bringing several of its adoptable dogs to greet guests outside two of the restaurants. Please make your reservations on Open Table and note that it is for City Dogs Rescue and RSVP on our Facebook event pages: www.facebook.com/citydogsrescue.